The experienced team at Boot Solutions offer the full suite of boot modifications to ensure the perfect fit. These can be applied to new boots purchased from us or your existing boots. Although our boot fitters will make sure you are matched with the best possible model for your foot shape, there may still be certain areas of the boot shell that cause pressure on the foot. Common examples are bunions, bone spurs, large ankle bones and very wide feet. In this instance, our Bootfitters can modify the shell by heating and reshaping the plastic. This is also known as ‘punching’ the boot. Many people find that the natural alignment of their legs puts unequal pressure on either the inside or outside of their skis. They often don’t even realise it is happening, however it can really inhibit their skiing progress as they are subconsciously adopting an unstable stance (usually knees turned in, ‘knocked knee’) to compensate. To overcome this problem, there are two types of boot alignment: cuff alignment and canting. 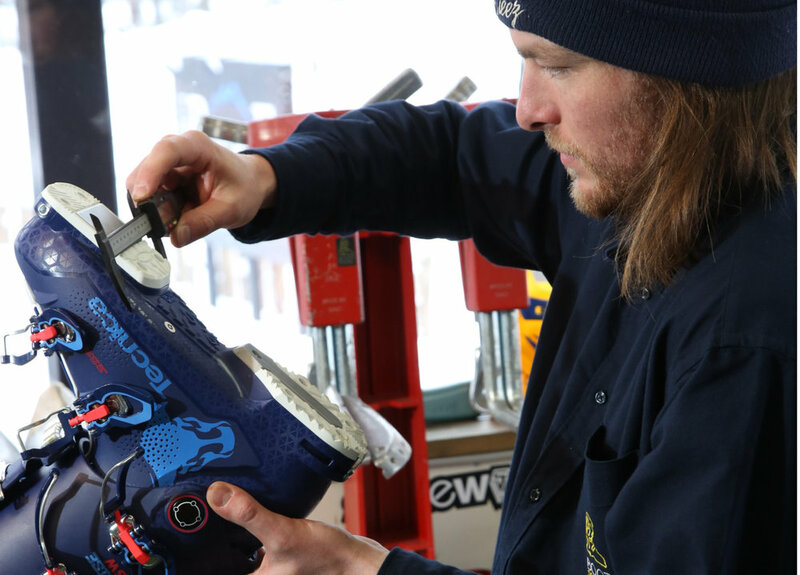 Cuff Alignment, which is available on most ski boot models, specifically deals with the inward or outward angling of your upper cuff; it does not involve an adjustment to the lower shell. The purpose of this adjustment is to match the angle of the upper cuff to the curvature of your lower leg for greater comfort, control, and more responsive skiing. Unlike cuff alignment, canting involves adjusting the foot and leg shaft angles of the entire boot. This is achieved by literally grinding an angle into the bottom of your boot sole so that your entire boot (not just the upper cuff) permanently leans inward or outward. A properly canted boot will bring your knee into its natural position, vertically above the centre of your foot and will provide much better precision on the slopes. Sometimes there can be one little spot in your skiboot that niggles you or causes you pain. In some instances this can be rectified by making adjustments to the ski boot liner, such as making extra room in the tongue or adding padding in certain areas. This power strap will close the gap between the shin and the tongue of the boot and therefore reduce boot problems such as shin bang. Once this gap is eliminated the boot also becomes more responsive. The Booster Strap also produces a progressive flex. Instead of flexing forward and trying to flex the plastic of the boot this strap allows a smooth elastic stretch before engaging the boot. Boot Solutions offers general boot repairs such as replacing broken boot buckles and boot straps.